The ability to read is one of the crucial foundations on which success in life, and certainly in the information age, depends. If your child is struggling with reading, you know the frustration he or she faces in keeping up with schoolwork. You also know that this deficiency must be dealt with in order for your child to make any real academic progress. You are probably sensitive as well to the emotional difficulties that poor reading skills can cause. There are several basic brain processes involved in reading. Binocular teaming, sequencing and brain timing issues all require significant integration between the two hemispheres of the brain. Many reading problems are caused by inefficient coordination and integration between the two hemispheres of the brain along with the many other brain structures and systems involved in the reading process and can be greatly enhanced by employing sensory processing skills development strategies. The Learning Breakthrough Program uses balance as a central component to address sensory integration disorders that cause learning problems. 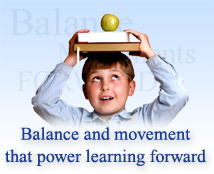 The specific activities that make up the Learning Breakthrough Program™, performed on the Belgau Balance Board, can help your child to achieve greater integration between the two hemispheres of the brain as well as enhance the development of the neural networks that are crucial to the process of reading. Learning Breakthrough Program™ activities have been more closely associated with improvements in reading ability over the past 30 years than perhaps any other single area of learning difficulties. To read about others' success stories with the Learning Breakthrough Program, click here. To learn about how the Learning Breakthrough Program works, click here.